Back from sold! This home has everything for your active retirement lifestyle. 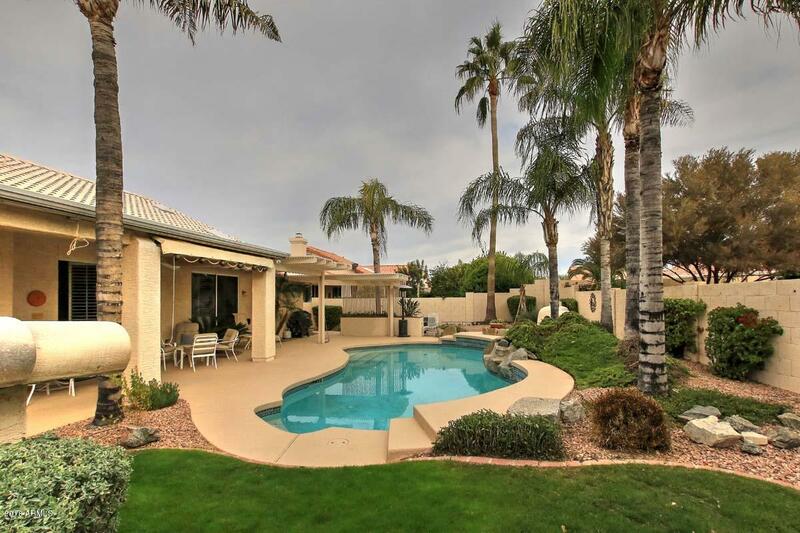 Spacious Borgata model situated in the beautiful active adult Robson community of Palo Verde Country Club. Welcoming entry opens into formal living/dining area with high ceilings and fireplace. Adjacent den/office has double doors, built-in bookshelves and cabinets. Great for entertaining with large open kitchen, family room and eating area overlooking the sparkling backyard pool and water feature. Even an elegant wet bar. Master bedroom suite is huge, with a sitting area and sliding door to the pool area. Generous master bath with double sinks, separate shower, garden tub and enormous walk-in closet. Guest bedroom and bath are nicely appointed as well. Light and bright with tile flooring in all the right places. Plantation shutters throughout, nearly new kitchen appliances, all appliances included. The backyard is a lovely oasis with plenty of covered and uncovered patio space and an outside fireplace. Easy care desert landscaping with just a bit of grass for your pet. Two-car garage with attached cabinets plus a golf cart garage, plenty of room for your toys. All this plus the amenities of Robson communities - Gated entry staffed 24 hours a day, security patrol, golf course, community center including restaurant and lounge, tennis courts, bocce ball, billiards, workout facility, and all the clubs and interest groups you can think of. A great place to spend the winter or all year round. Come see for yourself, You'll love it!